There was never really a singular style or movement of blues music that characterised New York – the city was simply a hotbed of varied musical activity designed to feed the jukebox market and the burgeoning market for ethnic records around the USA – and this 48-track 2-CD snapshot of the blues and R&B that was being played there in the post-war pre-rock ‘n’ roll era demonstrates the variety and creativity of the music. 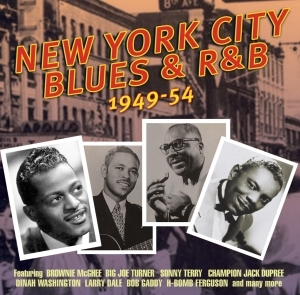 It features some well-known names who went on to play a major role in the blues revival of the ‘60s and beyond – Brownie McGhee, Sonny Terry, Champion Jack Dupree and the like – plus some other big names like Dinah Washington and Big Joe Turner, alongside many lesser known and collectable tracks by artists whose focus was much more local. It’s an evocative and slightly different angle on an ever-popular genre.